PlayMaker integration is no longer maintained. The integration package and this documentation is legacy. Integration of NodeCanvas with playMaker is two-fold and in both cases it is possible to Sync Variables from one system to the other. A whole playMaker FSM can be part of a Behaviour Tree as an Action. 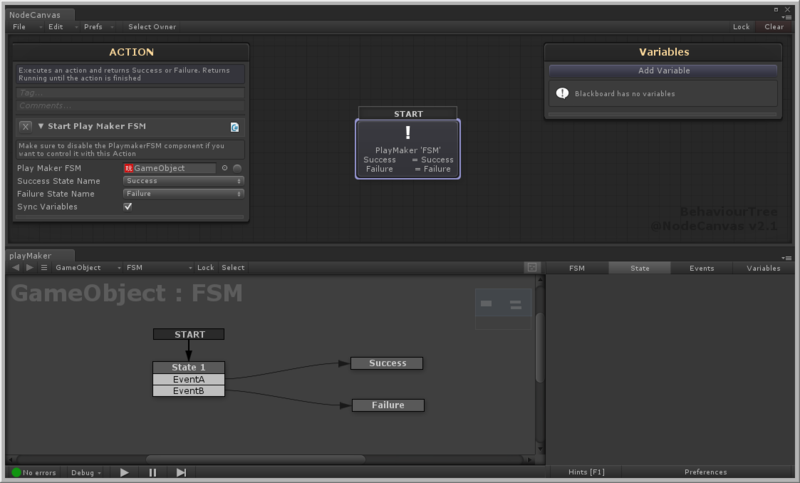 Simply use the included NodeCanvas Action Playmaker/Start Playmaker FSM. In that action you have to select the PlayMakerFSM to execute. The selected playMaker FSM will get disabled on awake. As soon as the action is executed it will get enabled and start. In the action you have to chose two playMaker states; one for Success and one for Failure. As soon as either state is entered, the playMaker FSM will stop and the action will return Success or Failure based on that state entered. These two states can just be empty states. If the option to Sync Variables is checked, then the value of all common variables (name + type) between the Behaviour Tree blackboard and playMaker FSM, will be copied over to the playmaker FSM on execution, which then will be possible to change and modified by playMaker and then copied back to the Behaviour Tree blackboard! You can make a Behaviour Tree Owner as normal set it to ‘Do Nothing’ OnEnable. Then in a playMaker state add the action Enable Owner Behaviour, found under the NodeCanvas category in the Action Browser. In that action, assign the Behaviour Tree Owner. When the Playmaker FSM state is Entered, it will start the Behaviour Tree of the owner. When the state Exits, that Behaviour Tree will stop. The best use scenario would be to set Run Forever in the BehaviourTreeOwner to false and get a FinishEvent in playMaker. There is no special setup from the Behaviour Tree Owner side in this case. 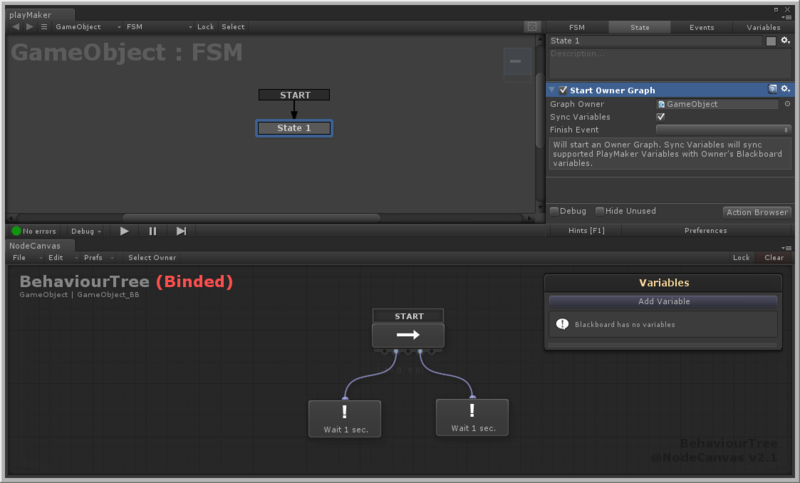 The Sync Variables option works like before, but in this case the variables are copied from the playMaker FSM and to the Behaviour Tree blackboard and then back to the FSM instead!